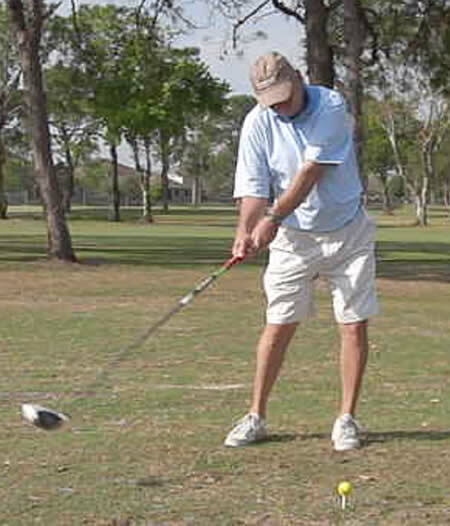 I gave a golf lesson this week where the golfer flew in to Florida from Texas for the sole purpose of learning how to increase his swing speed with the driver. His average swing speed was 85 mph, and he felt like he had more speed to give, but the instructors he worked with in the past told him that he was maxed out or suggested he needed some golf swing speed training program. Of course, you guys have seen my track record with boosting swing speed, and I assured him he would have no trouble picking up 20 or 30 yards in our 1 hour golf lesson. Results? Let's see what we started with first. It should come as no surprise that this golfer lacked lag in his golf swing, and that was costing him all his club head speed. If you want to learn how to increase your golf club swing speed you must understand the importance of lag. Yep, his left hand is at the same position in the downswing, but the club head most certainly is not! As you can imagine, this is a slight increase in lag. Combining the left arm drill from the "Reshaping Your Golf Swing for Lag" video and the upcoming right leg load video to assist in his sequencing, the results are ridiculous. Of course, having too much of a good thing causes problems as well. It's perfectly OK to exaggerate things at first while learning a new movement, but take a look at what all this lag did to his impact position! 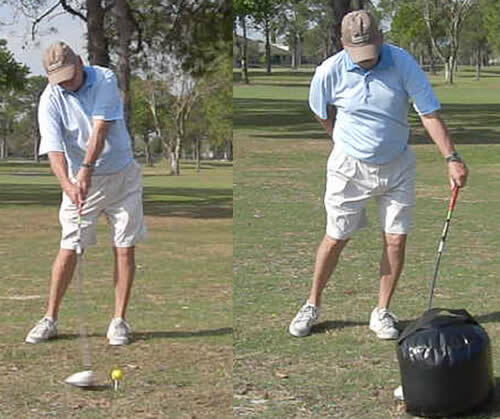 The image on the left is his "before" impact position. Once the right hand is put back on the club, things can't quite get this far out of control, but learning to use the left hand first as I describe in this golf swing speed drill is key to learning the feelings of creating lag in the golf swing. Now we're talking. In an hour long golf lesson, his swing speed maxed out at 97 mph with the impact bag and 93 while hitting a ball. 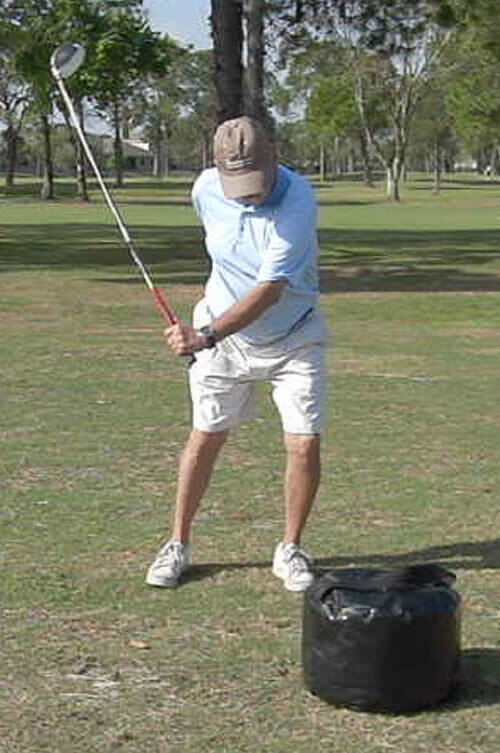 The little "white devil" has a tendency to make all golfers fall back into their old movement patterns, so don't be surprised if you're able to make massive changes while hitting the impact bag and only incremental changes while hitting an actual golf ball. Every golfer goes through the same process of learning in stages like this. As he continues to work on the drills exactly as I prescribed them, he'll easily be able to transfer that 97 mph swing speed from the impact bag to the back of the ball, for a potential increase of 36 yards off the tee. As it is now, in the one hour golf lesson, we picked up about 24 yards. More importantly, we changed critical golf swing mechanics that will allow him to break the 100 mph mark very soon, and he'll be able to do it with less effort than the way he's currently swinging at only 85 mph! If you want to pick up 12 mph swing speed in your golf swing, click the button below to check out a Premium golf instruction video that will teach you all about creating lag, just like you saw here with this student. 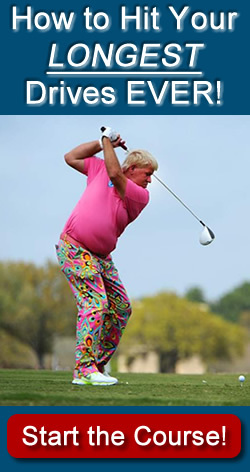 There are certain attributes you simply can’t change about your golf game. Most of these set-in-stone characteristics are related to your physical tools. As the saying goes, “you are who you are.” Some players are bigger, some are stronger, while others seem to have ice water in their veins and never miss a critical shot. Physical size and mental toughness are hard to tweak, but other things are in your control – take swing speed, for instance. Swing speed is paramount to better performance on the course. And also the diamond and rink, too. Take any sport that requires a swift swing, and the most successful players all have one common denominator: superior swing speed. Hank Aaron wasn’t the biggest slugger, but extraordinary hand strength combined with a lightning-quick swing made him one of baseball’s legendary homerun kings. Likewise, Wayne Gretzky, was somewhat undersized but utilized on-ice intelligence with a surprisingly quick release to become the NHL’s all-time leading scorer. These same principles hold true for golf. Increase your swing speed, and good things will happen on the course. The game’s premier players are all known for their swing speed. Jordan Spieth, Rory McIlroy, Tiger Woods, Sergio Garcia and others – the greats have used golf swing speed training for peak performance. 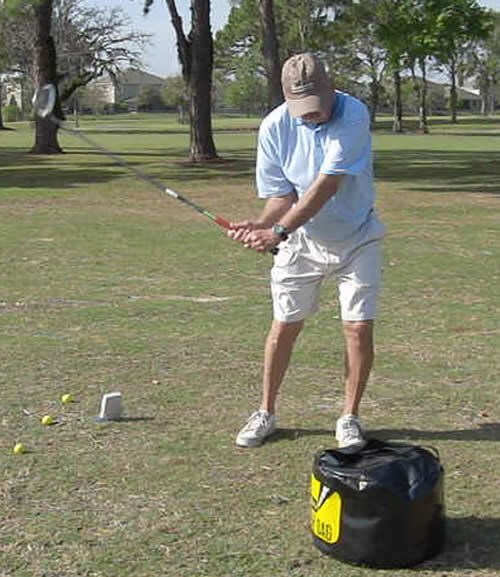 Rotary Swing offers you the necessary instruction on how to increase your swing speed. Improve your golf swing speed with these swing drills. Our proven methods have been shown to increase golf club speed up to 12 miles per hour. That may seem insignificant, but consider this: most golfers swing the club around 80-85 miles per hour. But if you increase your golf swing speed 12-15 miles per hour, you’re up around the 100 MPH threshold, which can add 25-30 yards off the tee! Learn how to increase your swing speed with Rotary Swing’s exclusive online golf instruction videos. We’ll cover all the important aspects of golf swing speed training, from creating lag through the swing to following through for optimum distance and improved accuracy. Try our golf swing speed drills today. When used with other Rotary Swing video series (such as our 9 Days to Amazing Ball Striking video series), your game will show dramatic improvement. See how Rotary Swing’s science-backed, student-first approach has helped golfers all over the world. For more information, or to find out more on how to increase your golf swing speed, please visit our contact page to send a secure message. Thanks for visiting Rotary Swing!